Gorod Leta performed both jazz and pop numbers in the first cultural event held by Delhi’s Russian cultural centre in 2014. 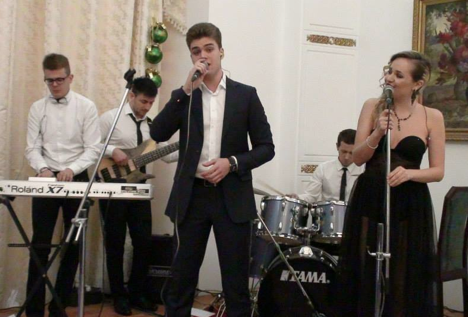 The band also performed at the prestigious annual New Year Ball, held by the Russian Embassy. The 2014 cultural calendar kicked off in Delhi with the Russian Centre of Science and Culture (RCSC) hosting a concert featuring Russian jazz band ‘Gorod Leta (Summer City).’ The concert was dedicated to the Russian Orthodox Christmas and was jointly organized by the Embassy of the Russian Federation in India and the RCSC. Alexander Kadakin, the Russian Ambassador to India, was present at the concert. The crowd comprised of people of all age groups and different walks of life in the Indian capital, including foreign diplomats, Delhi’s glitterati, alumni of Russian universities, music lovers and artists, among others. The concert overwhelmed the enthusiastic members of the audience. The musicians and singers from the Moscow band looked to turn the chilly evening into a ‘little summer’ for the audience, who gave a series of huge rounds of applause. A multitude of cultural programmes will be held at the Russian cultural centres in India in 2014, which has been labelled the Year of Culture in Russia. Gorod Leta also performed at the prestigious Russian Embassy Ball on January 10. The masquerade has become a tradition and is a sought-after event in the cultural and social life of the Indian capital. Masquerade balls were a feature of the Carnival season in the 15th century, and involved increasingly celebrate allegorical Royal Entries, pageants and triumphal processions celebrating marriages and other dynastic events of late medieval court life. They were extended into costumed public festivities in Italy during the 16th century Renaissance (Italian, maschera). Many guests at the ball wore unique and handmade costumes. The independent jury and Ambassador Kadakin had trouble choosing the best male and female costumes – the king and the queen of the ball. The first prize for the most creative woman’s costume went to Evgeniya Karmalito, spouse of the Senior Counsellor, who wore a creative INS Vikramaditya costume. The first prize in the men’s category went to billionaire Chetan Seth for his forest man costume.